Please contact us if you are interested in planning a safari. 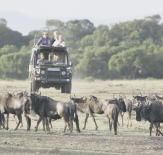 "The guided safari experience you put together for us was both professional and immensely enjoyable. Each member of our family brought back their own treasured memory that will no doubt last a lifetime!"